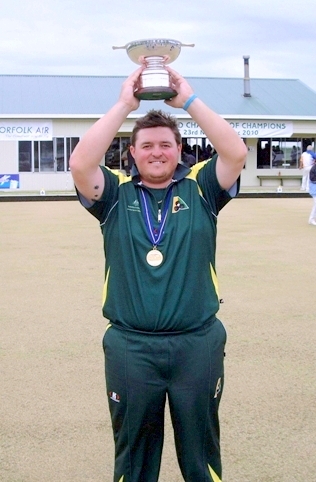 At just 25 years of age Aron Sherriff rewrote the Bowls Central Coast record books when he became the first player ever to take out all four Zone Championship titles in the one year ie Singles, Pairs, Triples and Fours. The “Grand Slam” is a unique achievement and in winning these four open titles he also became the most prolific winner of these Zone championship titles having captured an outstanding 19 titles in total and overhauling Phil Flippence on 17 and the Gosford City legend Joe Haggerty on 13. Aron has recorded his most number of wins in team disciplines having won the Zone Fours on six occasions, the Pairs and Triples five times each and the Singles just three times. It also follows that he holds the Bowls Central Coast record for Bowler of the Year having been awarded the Wal Rainbow “Bowler of the Year” Perpetual Shield on six occasions and this year’s Grand Slam ensuring it will become seven. Such success at Zone level is quite independent of his achievements at State, National and International level and as a Zone we are privileged that he still finds the time to compete in Club and Zone events. Not to overlook that he has already represented NSW in the State side on more than 100 occasions, an amazing record for someone so young. The bar keeps being set higher and higher and 2010 was perhaps his biggest year yet winning the Australian Singles title, representing his country in the “Green and Gold” at the Delhi Commonwealth Games and then winning the World Champion of Champion of Singles in Norfolk Island. He came back home to improve his fathering skills with his wife Amanda and new baby daughter Zoe and to resettle in a new club at Ettalong Memorial under the stewardship of John Roberts. Aron is a modest champion and was the first to recognize his team mates in Tony Laguzza, Lee Trethowan, John Roberts and Harley McDonald all of whom played an important part in his Grand Slam victories. At the presentation of the Zone Triples badges and prize money Aron also acknowledged the Ettalong Club management and members for making him feel so welcome and making the transition into his new club so easy. He is relaxed in his new environment and that is also contributing to his good form and level of consistency. It is also interesting to note that the Ettalong Club with the help of Aron has also recorded a record breaking year on the green having won all 2011 Zone titles in the Under 18’s, Open and Senior events as well as being represented in five out of the seven Zone Pennant finals and winning the No1 and No3 Pennant Grade flags. Aron is a great ambassador for his Club, the Zone and the sport of lawn bowls and may he continue to re- write the record books at all levels of the game.